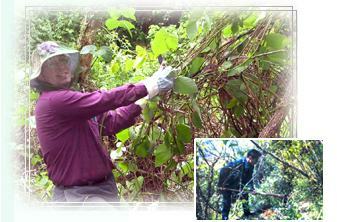 Kudzu is a coarse, high-climbing, twining, trailing, perennial vine. The huge root, which can grow to the size of a human, is the source of medicinal preparations used in traditional Chinese medicine for two thousand years, and modern herbal products. Kudzu grows in most shaded areas in mountains, fields, along roadsides, and thin forests throughout most of China, Taiwan and the southeastern United States. 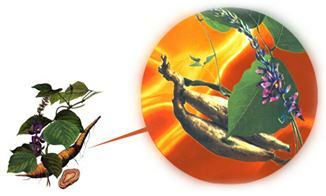 Kudzu root is high in isoflavones, such as daidzein, as well as isoflavone glycosides, such as daidzin and puerarin. In Traditional Chinese Medicine, kudzu root is used in prescriptions for the treatment of wei, or "superficial," syndrome (a disease that manifests just under the surface-mild, but with fever), thirst, headache, and stiff neck with pain due to high blood pressure. It is also recommended for allergies, migraine headaches, and diarrhea. The historical application for drunkenness has become a major focal point of modern research on kudzu. It is also used in modern Chinese medicine as a treatment for angina pectoris. The root of kudzu, Pueraria Lobata, is also used as herbal products for Alcohol Withdrawal and angina or angina pectoris in many countries. Are there any side effects or interactions? 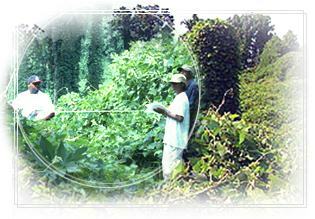 At the amounts recommended of science and medicine report, there have been no reports of kudzu toxicity in humans. 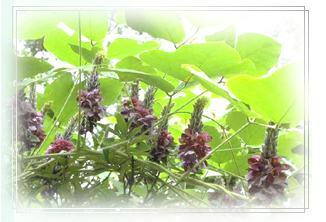 At the time of writing, there were no well-known drug interactions with kudzu. 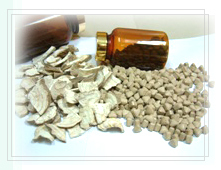 We produce pure Kudzu root extract powder and Kudzu root extract tablets for a good herbal remedies. We mix pure Chlorella powder with Kudzu Root Extract to produce Kudzu-Chlorella tablet for the health care market. According to traditional Chinese Medicine experience and modern Laboratory report, it contains standardized extract of Kudzu (pueraria lobata). Which may relieve : muscular tension and spasms, fevers associated with flu and colds, colitis, sudden nerve deafness, hypertension, dysentery, thirst, headache, allergies, diarrhea, angina pectoris, and, to improve the ability of memory of elder people, to dilate blood vessel, to reduce tobacco dependency and, offers support for alcohol withdrawal.